with people across Asia-Pacific who’ve caught our eye, using the Internet to create, connect and grow. This week, we’re featuring a mash-up of two online content creators — EatYourKimchi and TalkToMeInKorean — who have come together to collaborate in the offline world. How would you describe your YouTube channels in one sentence? EatYourKimchi (EYK): Simon and Martina: Canada, Korea and beyond. TalkToMeInKorean (TTMIK): We help people around the world learn Korean. On the face of it, you don’t seem to have much in common. So what brings you together? TTMIK: We both went online—onto YouTube in particular—because we realized that it offered a better way to connect with friends, family and other viewers. Initially we published our audio lessons through our podcast feed, but thought it would be great if we could also make videos lessons which people could share more easily with their friends. Now it feels like we’re talking to our students around the world in a virtual online classroom, rather than having a one-way conversation. EYK: We wanted to show our families what our life was like in Korea and video made that possible, especially as most of today’s real-time video chat apps weren’t around then. We thought we’d just shoot some videos and put them online for our families to see. It just turns out that our family got a lot…bigger! You’re building a coffee shop together. Why did you decide to collaborate offline? EYK: It’s the next logical step given where our businesses are growing, and they just so happen to converge in all the right areas. We both have very strong online communities, but we don’t have many effective ways to meet them offline. 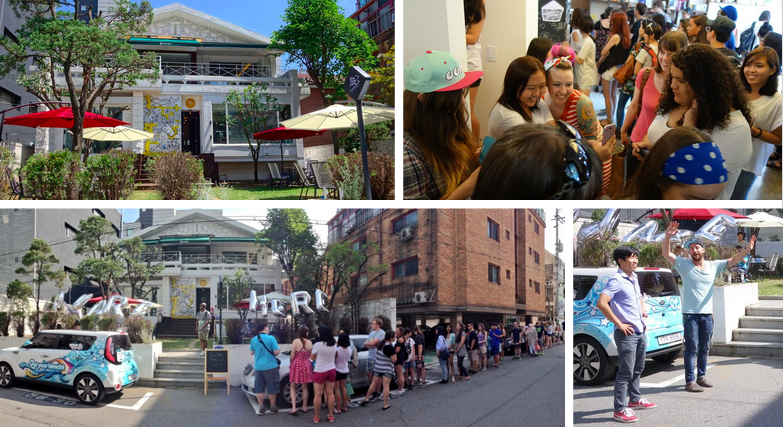 TTMIK has language meet-ups at other people’s coffee shops, and we keep on doing events and meet-ups in different places around the world. Why not have our own place where we can meet each other at once? We’d also love to have other YouTubers use our space to meet their audiences as well! TTMIK: Many of our 5 million students who’ve learned Korean through our channel dream of coming to Korea for a visit or to live here for a while. And when they finally get here, they tell us they wish they had a place where they could practice their language skills and meet their online teachers. So, really, building a bricks-and-mortar cafe is a natural extension of what we do online. What do you think offline entrepreneurs can learn from online entrepreneurs? EYK: What we see with a lot of offline businesses is a “if you build it they will come” approach, in which restaurants and other businesses open up and just sit and hope that people will come. To us, it looks like many offline businesses are putting the cart before the horse in building a place and developing a following afterwards. We’re taking a safer approach, I think: we’ve developed a relationship with our audience, and we want to build a place for them. This post is part of our regular series of interviews with people across Asia-Pacific who’ve caught our eye, using the Internet to create, connect and grow. This week, we’re featuring a mash-up of two online content creators — EatYourKimchi and TalkToMeInKorean — who have come together to collaborate in the offline world.